I very much appreciate your effort. Being able to supply and repair the motors was critically important. TigerTek provides motor rewinding services in Greensboro, NC, with free pickup and delivery within our fleet area (central North Carolina and Southern Virginia). Our team of highly trained technicians has logged hundreds of hours on electric motor rewinding and repair services, and uses an in-depth process to test and repair the motor. After disassembling the motor, we perform a Surge Test and a Hi-Pot test to evaluate the condition of the motor windings. We use sophisticated test equipment, which is calibrated annually to UL standards to perform these tests. These outputs give us a precise report on whether the windings are shorted, grounded, or whether they are beginning to show any signs of pending failure. 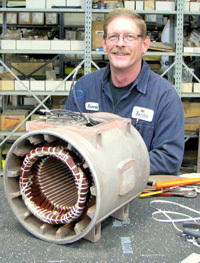 The crown of the old winding is removed and the motor stator is placed in a burn out oven. 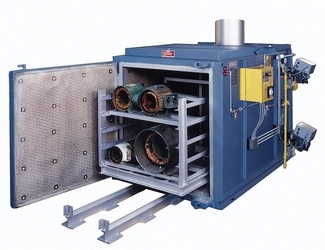 TigerTek only uses computerized, pollution control, ovens to precisely control this process. Temperatures can reach up to 750 degrees F, and the process can take up to 8 hours. This process is CRITICALLY important for a successful motor repair. If you do it correctly, then your motor will not lose any efficiency, which measures the performance of the motor. Any efficiency loss means that your repaired motor will be using more electricity in the future. This means higher operating costs. TigerTek's controlled procedures guarantees zero efficiency loss after repair. This test determines whether the iron in the motor has lost any of its magnetic properties. This would negatively affect motor performance. Outputs are recorded and filed. Our motor rewinding department is staffed by industry specialists, with many years of technical expertise. Every motor has its own unique set of winding specifications. We replace each winding to precise OEM specifications. 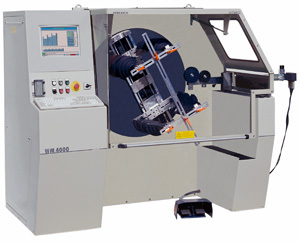 TigerTek uses state-of-the-art computerized rewinding machinery to ensure that each set of coils is made to exact dimensions, and that the copper gauge size and number of windings in each coil set is exactly correct. The rewinder then insulates the slots in the stator and rewinds the motor; after completing this process, the rewinder makes the electrical connections. The newly rewound stator is then tested and bathed in a coating of varnish. It is then placed in a bake oven to cure, which typically takes about 6 hours at about 275 degrees F. Once again, TigerTek takes meticulous steps to control this process. The newly rewound motor is then cooled and all machined surfaces are cleaned, before being handed off for motor reassembly, QC and final performance testing. It's a complex, intricate process. But in the hands of the TigerTek professionals, using high-end rewind equipment, you are assured of a repaired motor with zero efficiency loss that meets all OEM performance specifications. To speak with one of our motor specialists, call us now at , or contact us today to discover the TigerTek difference!